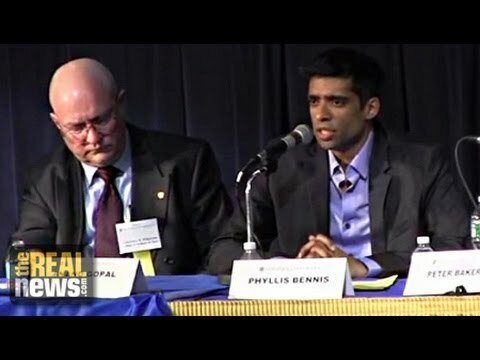 JAISAL NOOR, PRODUCER, TRNN: At the George W. Bush Presidential Conference at Hofstra University, several former Administration officials defended the legacy of the 43rd President and argued the wars in Iraq and Afghanistan were legally just and carried out in the best interest of the American people. However, there were a few dissenting voices. Among them was author and journalist Anand Gopal, who extensively covered he war in Afghanistan. He’s the author of No Good Men Among the Living: America, the Taliban, and the War through Afghan Eyes. ANAND GOPAL, AUTHOR AND JOURNALIST: Back in 2001, on 9/11, I very much viewed the world through the language and the terms that they’ve employed. I was living near the twin towers on that day, I had lost friends in the attacks. And I believed that the war on terror was one that was against people who hated our way of life, people who hated freedom, people who were hellbent on destroying everything that we stood for. And maybe some of that is true if you think about Al-Qaeda, but what I learned very quickly is that it’s also much more complicated than that. I moved to Afghanistan in 2008, and I hit the road very soon after. I took a motorcycle, I lived in villages, and I got the opportunity to meet people from all walks of life. And what I learned in that, in those trips, is that those ideas, really those Manichean ideas that I had back in 2001, I think weren’t very accurate. That was a ringing phrase for me. I didn’t necessarily agree with him. But hearing him put it in this way, which was the way it was talked about back in 2001, was a watershed moment for me because it spurred me to investigate how Afghans really viewed the war on terror, and the American war. Particularly Afghans who were living in the South, where the war is being fought. So not living in those areas that are peaceful, but living in the areas where there is constant fighting to this day. Here’s what I found. After 2001, Al-Qaeda had fled the country after the U.S. invasion. We know that, right? Al-Qaeda went to Pakistan, some of them went to Iran. Eventually some of them regrouped in Iraq, after the Iraq invasion. So after the 2001 invasion of Afghanistan, there were, essentially, no Al-Qaeda in Iraq. In Afghanistan, sorry. At the same time, the Taliban, from the rank-and-file to the senior leadership, quit. They surrendered in December of 2001, some of them met, in fact, with Hamid Karzai, who was being escorted by the Special Forces, to engineer a deal. And in the subsequent months, every single, most of them in fact, or every single one, from the senior officials like the Minister of Justice, the Minister of Defense, the Minister of Interior, aides to supreme leader Mullah Omar, all the way down to rank-and-file field commanders surrendered and tried to switch sides. The reason these Taliban members tried to switch sides was not because they suddenly felt that they believed in the American ideals of freedom or they loved the United States, but this is how war worked in Afghanistan the last two or three decades. If you go back to the Soviet Occupation, when the Soviets left in 1989, a lot of those Afghans who called themselves Communists rebranded themselves as Mujaheddin, or holy warriors. During the civil war in the mid-90s, people would switch sides out of nothing more than bald pragmatism because, in a conflict where life, where things could get so deadly, you learned very quickly that you would switch sides depending on which way the wind blew. Similarly, in 2001, these Taliban members tried to switch sides. There were a number of high-profile incidents — incidents that were covered in the press at the time. Covered in the New York Times and other places, in which Taliban members tried to hand over their weapons and tried to cut a deal with the new officials and find a way to not be persecuted. As an example, in early January of 2002, there were efforts to raise funds for the Taliban by radical Pakistani clerics. They were going to madrasas and trying to get donations in an effort to bring the Taliban back on their feet. At the time, Agha Jan Motasim, who was the finance minister of the fallen regime and was close to Mullah Omar, the supreme leader, he said publicly to reporters, please do not donate to us, because we are defeated, we are defunct. Please give your money elsewhere. As another example, in January of 2002, the Minister of Defense, Mullah Obaidullah, along with the Minister of Justice and a number of other top officials publicly cut a deal with the Afghan governor of Kandahar province, and handed over truckloads of weapons in exchange for staying at home and living in immunity. So you had a particular type of situation in January or February of 2002, where you had thousands of soldiers, mostly Special Forces soldiers, on the ground in Afghanistan, but you had no Al-Qaeda, and the Taliban as a military movement was essentially defunct. So in other words, you had thousands of soldiers on the ground without an enemy to fight. But we had a political mandate, and that mandate was that we’re here to fight a war on terror, and you’re either with us or against us. This Manichean worldview essentially categorized Afghans into two categories, which were either terrorists or good guys, really doing away with all of the shades of gray that make the reality of Afghanistan. And so this was a contradiction. How did that contradiction get resolved? Well, in a very profound and I would say very tragic way this contradiction got resolved, which is that the U.S. allied with the warlords. Local commanders and strongmen. And in effect, the enemies of those warlords became the enemies of the United States. Now you have to remember, back in 2002 in Afghanistan, an extremely underdeveloped country, there were no cell phone towers in most of the country. So most of the intelligence was human intelligence. Not signals intelligence, and so all the intelligence that was coming to the U.S., or almost all of it, was coming through local proxies. Local warlords, local commanders, local figures who had a very complicated history on the ground, who had their own enemies, who had their own rivalries, who had their own hatchets to bury. And in fact, their enemies became our enemies. And so the U.S. didn’t go to Afghanistan and create a dictator. Or, you know, as you refer, I think — one of you referred to one of the options of the American policy as going and creating a dictator. Instead, what the U.S. did in Afghanistan was create hundreds upon hundreds of small dictators in villages and in districts around the country. Men who were armed to the hilt, who were paid, who were given contracts to the detriment of statebuilding and nationbuilding, over the years. I’m going to give you an example of this, which happened to a friend of mine in Kandahar province. He was somebody who lived across the street from me. When I met him, he was in his eighties. He was eighty-five or eighty-six years old, and he was an old Mujaheddin fighter. Fought against the Soviets. But he was in retirement, and he would come sometimes to a bakery that he owned early in the morning, four or five AM, he would knead dough. One morning, militiamen showed up outside of his house. His name is Shiraf Hudim. Militiamen showed up outside of Shiraf Hudim’s house. And they asked for him, and he came outside. They said, “Are you Shiraf Hudim?” He said yes. They said, “We have intelligence that you are a terrorist,” and they arrested him. And he protested, of course, that he wasn’t a terrorist. He was just a baker. But nonetheless, they arrested him. They handed him over to U.S. Special Forces who were based in Kandahar Air Field. There he went under interrogation. He had metal hooks inserted into his mouth. Those hooks were twisted. He was beaten. He was, they kept saying that he was an Al-Qaeda mastermind, he was a Taliban mastermind, and they were convinced of this fact because they had intelligence from Afghan warlords that this was so. He kept insisting that he was not an Al-Qaeda mastermind or a Taliban mastermind, and they could not get a confession to him. So eventually the U.S. forces turned him over to the Afghan militiamen, the same ones that originally captured him. These Afghan militiamen then took him to a private jail in Kandahar City, took him downstairs, a couple of floors down, and they hung him upside down. For eighteen to twenty hours a day, they hung him upside down and they whipped him. He was hung with a number of other tribal elders and other people who these militiamen wanted to extract intelligence from. One of them was a very famous tribal elder from the district of [panjwei] and he was whipped so much that he was eventually killed. Shiraf Hudim quickly realized that what these men were after was not necessarily intelligence, because there was no intelligence to give. What they were after was money. In other words, if you were to pay, he would be given his freedom. And so his family raised money, they sold some of their goods. They collected the funds, and they delivered it to his captors and he was released. Now, the problem, though, is that once he demonstrated that he was able to pay for his release, then he was a marked man. And so like clockwork, every few months he was arrested again by the same militiamen. He was then transferred to Kandahar Air Field, to the Special Forces, who accused him of being, once again, an Al-Qaeda mastermind. He was eventually returned back to the militiamen, hung upside down, whipped, until he could be paid again. Now, this charade went on for about three or four years, until 2005, when the commander of the unit that was arresting him was killed in a suicide attack. And the … the major commander of the intelligence services that ran the militia that was torturing him, he now lives in California. He was brought here, and he has many family members who are now American citizens. So this is the, this is the situation. I can repeat hundreds of stories like this — in fact, my book has many stories like this — of people who are caught in this, what we call the war on terror. Which in fact, in Afghanistan, turned out to be wars against local communities in which certain warlords and certain commanders were eliminating their enemies, or using the United States to gain riches, to gain power. We live with that legacy today. I think the processes that created the insurgency in Afghanistan took root in 2002, in 2003. By 2004 the Taliban had reconstituted itself as a fighting force. It was now based, leadership was now based in Pakistan, and it was very hard — the moment of opportunity that existed in 2002 had passed, it was now very hard to undo what had been done, and we’re still living with the consequences of that in Afghanistan. And so I think when we think about the legacy of the war in Afghanistan, the legacy of George W. Bush, we need to think about what means for Afghans on the ground, and really interrogate why it is that fighting is still continuing in Afghanistan today. Thank you.